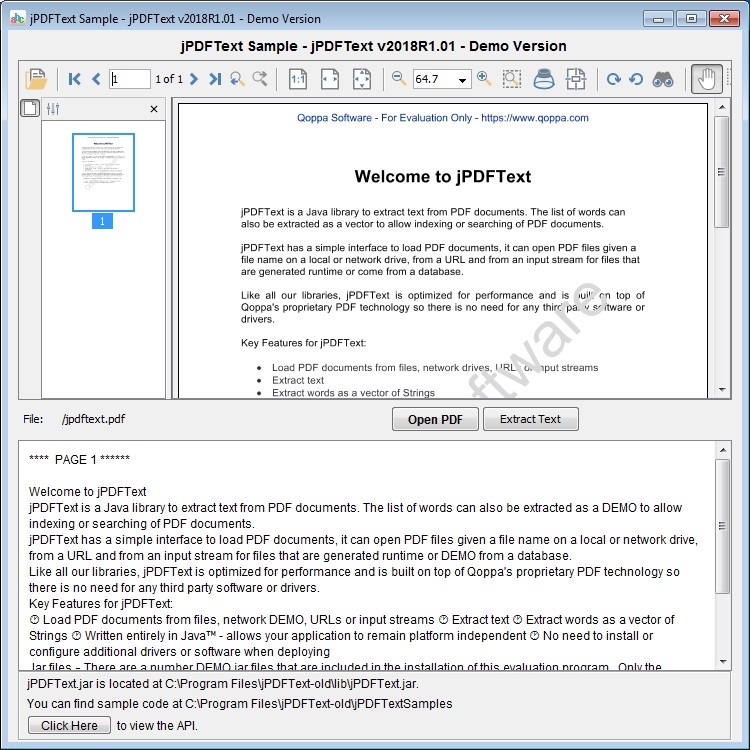 PDFText is a Java library to extract text from PDF documents. With jPDFText, PDF documents can be processed to extract the textual content for archiving, storage, searching or indexing. jPDFText is built on top of Qoppas proprietary PDF technology so you do not have to install any third party software or drivers. Since it is written in Java, it allows your application to remain platform independent and run on Windows, Linux, Unix (Solaris, HP UX, IBM AIX), Mac OS X and any other platform that supports the Java runtime environment. jPDFText can extract existing text content from PDF documents. If you are interesting in recognizing text in scanned PDF documents or PDF documents containing images, you may be interested in our Java OCR feature.